BELMONT, Mass. -- Nearly a century ago, incensed residents voted overwhemingly to buy the power lines, poles and street lights in their town and take control of their utility system from the unreliable Somerville Electric Light Company. 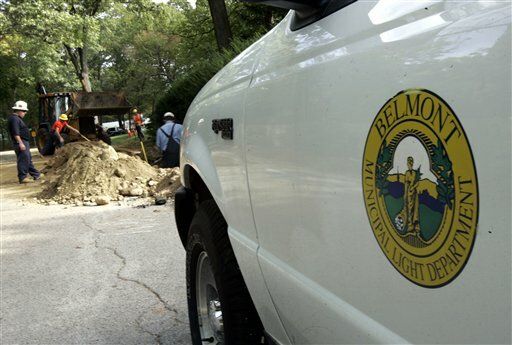 That vote paved the way for creation of the Belmont Municipal Light Department. Now, some lawmakers and consumer advocates want to make it easier for other cities and towns to do the same. Legislation spearheaded by Rep. Jay Kaufman, D-Lexington, would remove from state law a clause that defends utilities from municipal takeover. If it passes, power companies would have no choice but to sell local assets to cities and towns for a price arbitrated by the state Department of Telecommunications and Energy. It's been nearly 80 years since a Massachusetts community purchased the power lines, transformers and substations that light up homes and businesses and turned them into a public utility. For Ron Lunt, manager of Belmont's power company, there's more of a spark to the municipal utility than just the juice coursing to the town's 10,500 homes and businesses. There's the lower bills and quick response times when lines go down and lights go out. There's also something a little less tangible: he answers to the residents of this suburb northwest of Boston, not to shareholders and far-off corporate executives. Private, investor-owned utilities have pledged to fight the bill. They say they won't get a fair price for their assets, and towns can't do the job on their own. A takeover would unfairly shift costs to customers, they argue. But Patrick Mehr, a member of a committee that wants to create a municipal power provider in Lexington, dismisses that complaint. Towns are more than capable of doing the job, he said -- and doing it better. He compares NStar's service in his town to nearby Concord, which manages its own power supply. In Concord, the light department was able to bury power lines in the historic downtown, something Lexington has been unable to force NStar to do. A chief argument from supporters is lower costs. According to the Massachusetts Alliance for Municipal Electric Choice, municipal rates are 24 percent lower on average than private utilities, a number the companies don't dispute. Forty-one of the state's 351 cities and towns have municipal electric companies, serving about 15 percent of the population. They range from tiny Russell in Western Massachusetts, which has only 450 meters, to Taunton, with more than 34,000. Copyright © 2005 Associated Press.